Most of us are complaining about the heat and how its affecting us. Feeling listless, tired, hot, craving for very cold sugary drinks and so many other woos. However, I was just observing how the heat does not affect the kids that much. The kids in the school near our apartment were jumping, running and playing in spite of the heat. In the afternoon, kids from our apartments were playing football, running, skating and their energy levels were at the optimum. Looking at them made me feel even more exhausted. How can they be so hyper? Its nearly bed time but the kid staying above us is jumping away. Is it the food these kids eat? Boundless energy and constantly on the go. I guess we were the same when we were kids. Playing, jumping, climbing trees, walking to friends and relatives places. The main street near our home would become a playground for all the kids from the surrounding neighbourhood. At that time, there was hardly any traffic near our homes. Later when we moved to another area, we were lucky to have a huge garden and the Nairobi River flowed near our home. We loved going to the river to dip our feet, we walked to and fro from school and spent a lot of time outdoors. Coming to today’s recipe, mushrooms are low in calories, fat free, cholestrol free, gluten free. Low in sodium but rich in many nutrients. Its a good source of Vitamins B and D, selenium, potassium, copper and iron. Its a good source of protein. 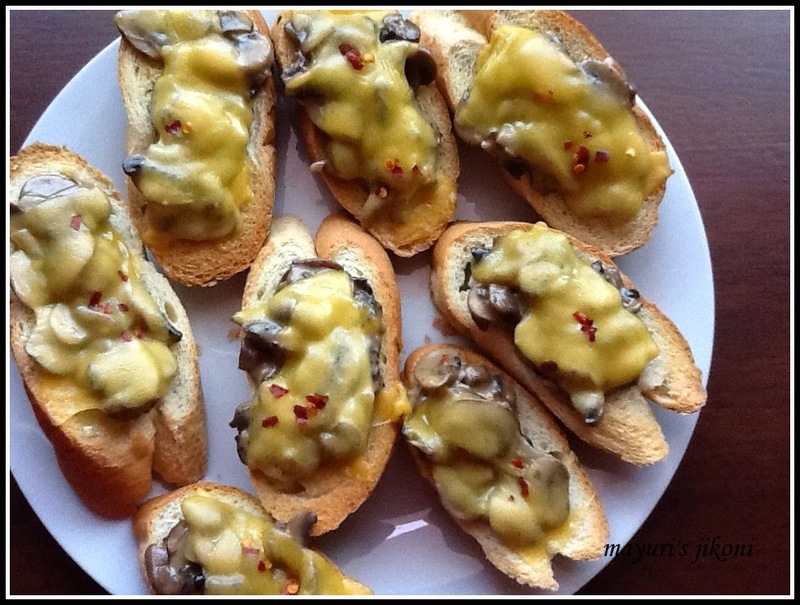 Mushrooms on toast can be served as a snack, as brunch with eggs or even as a light meal with salad or soup. Wipe the mushrooms with a damp cloth or wash them and pat them dry on a kitchen towel. Peel the garlic cloves and slice it thinly. Heat the butter gently over low heat in a pan. Add the garlic and stir fry till it becomes soft. Add the mushrooms. Turn the heat up to medium. Stir fry the mushrooms till they become soft. Take the pan off the heat and let the mushrooms cool a bit. Add salt, pepper, chilli flakes and cream and mix. Toast the slices of bread. Divide the mushroom mixture equally and put it on the toasted slices. Put the bread slices under the hot grill or broiler till the cheese melts. Serve with tomato ketchup or your favourite sauce and salad. Can use fresh chopped green chillis instead of chilli flakes. Use any cheese of your choice. You may add any other veg to the mushrooms that you like. Creamy mushroom on crispy toast sounds too good! will try it for my kids sometime soon. This is some yummy way to try toast , love this. 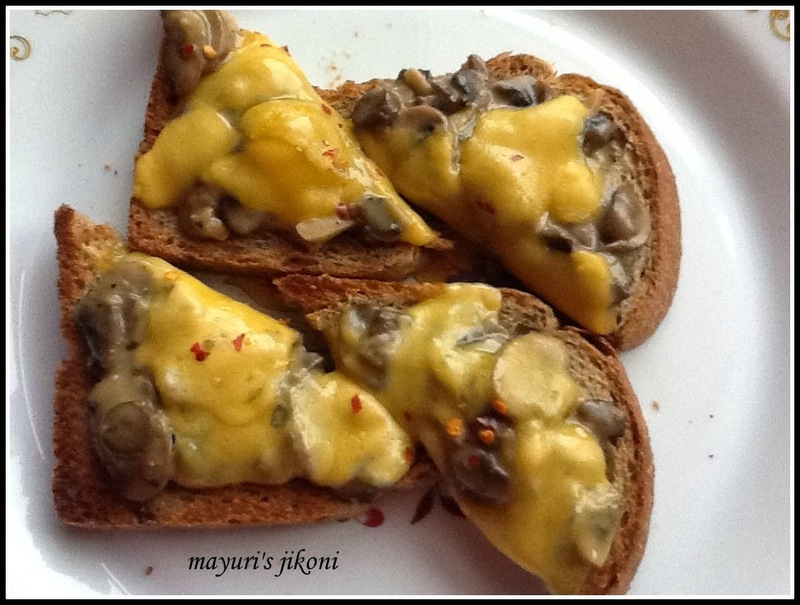 Delicious toast Mayuri love the fact that you made mushroom very healthy recipe.